Secondly we see more and more formulaic TV grace our lounge and Online TV screens – meaning it is less critical to pay attention as it used to be. The narrative arcs of the 5th cop show on that evening are very predictable and the fleeting ‘actual content’ moments in the latest reality talent or cooking show are telegraphed by dumbed down presenters. We now know when our attention is required, especially those inciting moments when emotion or serendipity may be possible. So with these two things happening there are a growing number of services trying to glue the two – either bringing the TV to the back-channel or layering the back-channel ‘over’ the TV. This is something back in the zeitgeist again and likely to appear in many conferences around the world in the next few years. It is that only now, after years of experimental services going back to the 50s, that true ‘remote’ social interaction alongside the TV can finally be realised. The main SAD (Split Attention Disorder) challenge remains though for keen ‘interaction or social media producers’, trying to develop services that run in parallel and in real time alongside TV, that with scheduled live TV the audience are often focused on the content itself. Unless they have ‘live pause’ (as in TiVo and other PVR systems), anything that takes ones attention away will mean forever missing that moment. Integrating live video (aka TV) into a ‘story focused’ work means some heavy technical, synch, lifting, but the services and tools available to them have and are changing as well as the evolving business model opportunities in being ‘connected’ in real time to your audience. I have covered part of this topic on and off for the past 4 years on this blog, in various presentations and in fact a long time before that when I was presenting across the globe as senior producer of BBC Interactive TV (more at one of my old sites garyhayes.tv) – of which many services were in fact ‘social TV’ by implication. Millions of ‘users’ interacting with the show and each other in real time ON the TV screen. But I say part of the topic because efforts so far (including my own) to really integrate group or social activity alongside traditional ‘broadcast, appointment-to-view’ TV have been pretty superficial and left wanting. 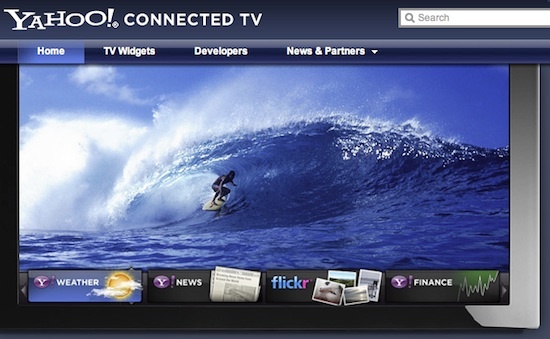 In fact a lot of ‘old school’ red button interactive TV companies I connected with when I was heading up BBC liaisons with them in the early noughties – are now transforming themselves and digging deep into those SocNet APIs and layering them into the same ‘tv widget’ based apps. This post was also motivated by a panel I am speaking at and producing at the Screen Producers Association of Australia Conference next week ‘Reaching Your Audience’. My panel is on the 360 Track and looks at many of the new hybrid TV forms detailed in the rest of this post. TV is in major transition where it is evolving from just scheduled broadcast to being always-on, participatory and social. Its traditional audience is now fully engaged with Social Media and here they effectively become ‘programme’ and content makers for each other but, in the backchannel, they still drive conversation around traditional, compelling broadcast content. There are many challenges ahead and this session will look at innovations across broadband and IPTV, latest business models, new advertising models and latest video web 2.0 mash-ups. We will also try to answer questions such as, is IPTV a valid platform for video producers? Where are the opportunities across on-demand platforms and is the old advertising model really broken? Is audience contributed online content sustainable at scale and what are the challenges of broadcasting and delivering on-demand? Is there a role for a public service broadcaster in a commercially driven IPTV landscape. IPTV used to stand for ‘Internet Protocol TV’ but in today’s Social Media world perhaps it really means Interactive and Personal TV. View more documents from Gary Hayes. 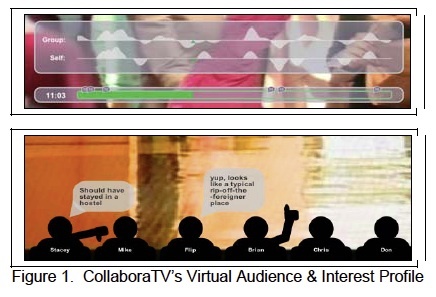 EMBEDDED: The social conversation stream is aggregated in 2D panes, alongside the actual video show either on the main TV screen or PC/mobile. Various widgets control your view and what elements you see – the show is pulled into your network view or you go to it. RESIDUAL: Shows are specifically set up on advanced TV or online so that you can comment as if its a blog – against the whole show or at various Community Created Indexes (CCIs) within it. You leave thoughts about the show and others come and respond to your annotation and add their own. A threaded, deeper discussion can take place around any moment in the show. This can also be done as group chats in audio, sort of DVD extra director & cast commentary style chats in audio or text around a show for others to follow later. MODERATED: There is a filtering of the social element as the show itself is formatted so the conversation is funnelled into the format. Presenter or panel response to the conversation in real time. Shifting the focus away from open discussion to focused around tasks. These will be new formats with potentially hundreds of audience members really feeling they are actively part of a live show. This is way beyond ‘Question Time’ two or three asked by the host, or hidden voting / commenting reality show – this is a new format about to happen! AUGMENTED TV: You are there in the same space around a shared screen but it is enhanced. You will all have different layers overlays of the same show but with Augmented Reality viewers (either hold up screens or glasses) you will be simultaneously taking part in any of the 5 above AND communicating with the physical folk around you. An enhanced version of a traditional webTV couple where one is talking about the show on Twitter while the other is on Facebook. ALTERNATE REALI-TV: This is where the TV show is both a trigger and an integral part to a broader story environment made up of social networks, physical shared spaces, game places, objects, devices etc: Often called Alternate Reality Games this is where highly social and collaborative behaviour by fans and puzzle solving creatives travel through a web of story – some made by the TV show producers much enhanced by the participatory audience. BOXi is an interactive quiz show with impressive 3D animations. It is primarily targeted to teenagers, and it includes studio teams from different schools. Viewers and studio teams answer general knowledge quiz questions, and viewers can win prizes in each episode. The show is hosted by a live presenter. The teams compete in a live studio environment, while home contestants send answers as SMS messages. 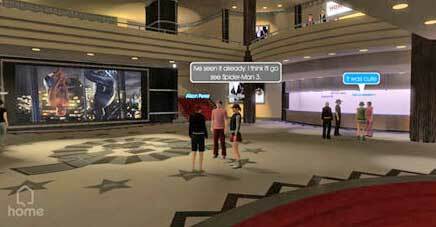 The game of home players is set in a 3D animated virtual auditorium, in which each player is represented by a virtual avatar. I personally think we are still jury’s out in regard to broader single screen social activity, but that in some situations and with the right genre of programming, there could be nothing more powerful as a new form. So below I have pulled together some of the real world services already in this space, with a TV screen or show centric bias, and yes by the time I have finished writing there will no doubt be four more. (note: I have included links to the key ‘online TV Social’ services at the bottom next to a slide presentation I did on the top earlier this year – these are online delivered TV with a back channel glue or other kind of integration on the same screen). Boxee is one of the new major players in this arena. Heavily based on linking with friends in your social networks and cross recommendation many are citing as the most robust model. 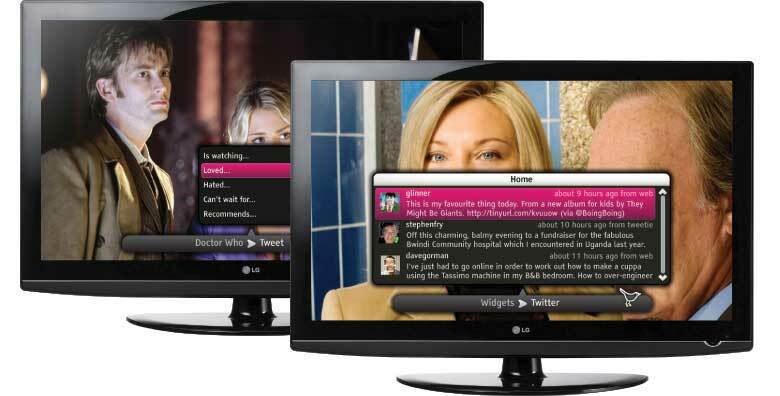 ‘It is a free, open-source software platform allowing users to share information about what they’re listening to or watching with other Boxee users or friends on social networks like twitter, facebook’ – having downloaded and started to use it there are quite a few wrinkles to iron out but with another key principle of aggregating TV content from the web around and onto the TV screen makes a lot of sense. Because Boxee above, is open source it of course means 3rd parties can come along and integrate social apps into the system and being a 3rd party as such can potentially integrate as many social networks as there are, social networks. Such as cliqset have done here adding nearly 0 to the system. 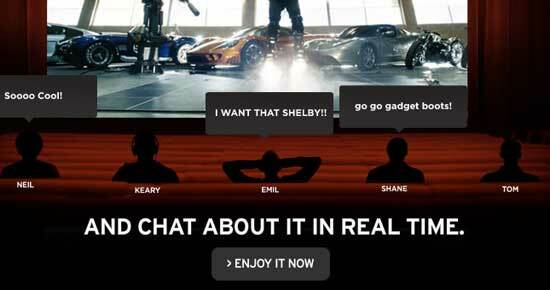 Real-time conversation is going where it hasn’t been before, your television. Introducing Cliqset for Boxee, an exciting new way to share and interact with your friends and the entire Boxee community while you’re watching your favorite movies, television shows and sporting events in real-time. Cliqset for Boxee lets you start a conversation with people about the show you’re watching, while you watch it, right on your TV or anywhere else you’re using Boxee. Through the power of Cliqset you can also stay in touch with what your friends and other people you’re following. A major Fiber Optic TV player Verizon with its aptly acronymed FiOS is typical of many of the IPTV based services cropping up around the world that will allow a whole range of integrated social activities – of course it should being naturally part of the web superstructure (once the walled gardens allow some external data to trickle in!). The widget based ones tend to be a portal to Twitter or Facebook for example rather than something truly integrated with the programming, which the web based, online-TV services tend to be. They will of course have the usual features coming to all ‘connected’ TVs, to be able to watch video from community created content sites including Veoh, blip.tv and Dailymotion – and it then begs the question will the social element, the recommendation elements actually be back with the host ‘sharing community’ ie: the ratings/comments are held external to FiOS. This may be the persistent fly in the ointment for closed IPTV with only a nod to external networks, which may be seen as being more a promotional link back to buying the service than actually adding value. SlipStream was developed by ‘The Do Lab’ who are one third (a good friend and ex BBC comrade) Jonathan Marshall. To quote their blurb it is a ‘Social Media platform. It integrates broadcast television and radio, on-demand services, personal content and programme metadata with social networks to create personalised, social and shareable viewing experiences.’ The suite effectively turns any basic STB into a very rich feature set Personal Video Recorder. On the Social TV side they are taking the heavy lifting route in that this is middleware that sits on potential any traditional, lower end broadcast, Digital Set Top Box (with an API of course!) but which links in real time to the social network data from the web. Integration of social interaction around programme content. Allows sharing of ratings, recommendations and personal content with the world at large. Brings social networking to the TV screen. Ever since the dawn of the Internet Age, tech companies have been promising to bring “convergence” of the online and TV universes, but those efforts have failed to take off with consumers who have found such products difficult to use. The new TVs announced on Wednesday will be in the market as early as the spring and will support widgets — small Internet applications — that run alongside broadcast TV content, but not over it. The applications can be used for a wide array of Web activities, like watching videos on Google Inc’s YouTube.com, social networking on News Corp’s MySpace.com, tracking stocks and sports teams, buying and selling on eBay, messaging friends using Twitter, or using Yahoo’s own photo-sharing website Flickr. EpixHD has some major studio backing being a joint venture between Viacom, Paramount, Metro-Goldwyn-Mayer Studios and Lionsgate. It looks set to succeed where others (Joost anyone) in the movie on the web space have failed and give some of the incumbants (iTunes?) a run for their money. EpixHD went into Beta in May 2009 and has just launched in October 2009 and is touted as a next-generation multiplatform premium entertainment channel. The interesting aspect for this post are the private screening rooms that look like the traditional cardboard cutouts of real time friends in front of the film. Heres a screenshot, some info from their FAQ and a little grassroots video from Steve Garfield. How do I invite friends to a private screening? – To use the screening room, click on the movie you want to watch with your friends, then look just under the player. On the right side, you’ll see the “Watch With Friends” button. Click that and you’ll be magically transported to the screening room and get a pop-up with a link. Copy and paste that link, and give it to your friends. Feel free to use the links on that page to easily share with Twitter, AIM, email, or Facebook. Invite up to 4 people…Once they click on it, they’ll join you in a private screening room, and you’ll be able to play and pause the movie. And if you want to talk, you can. Just don’t blame us if your friends tell you to shut up and watch the movie. One cool new feature Sky will get: a genuine online community. Sky viewers will get IM chat, friends lists and Xbox Live avatars, but MSFT has also created a new on-screen virtual sofa for those avatars to sit on, together with friends, during football matches. 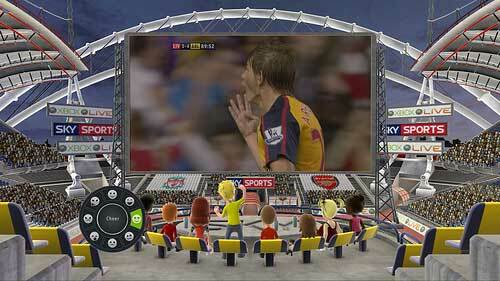 It will let viewers’ alter-egos goad fans of opposing teams or cheer a goal. While the interactivity looks to be limited to live sports so far, both parties say there’s more to come on the social side. “Xbox product manager Jerry Johnson gave paidContent:UK a demo of Sky’s new live and on-demand social TV service over Xbox Live”. TV started as a social activity; families would watch together around their single TV set. They would discover shows together and comment on shows in a synchronous viewing experience. However, the TV became a common household item and watching it was less of a family, or social, activity. The Internet separated the social aspect of content even further. Streaming video was brought to people’s laptops and computers on an individual basis. As content was made widely available to viewers on their computers and laptops, personal devices began to proliferate. One trend in social TV is that content is being accessed by consumers when and where they want. In 2007 broadcasters and content owners realized that the old method of content delivery would not work. They embraced the Internet as viewers adopted their devices as their main source for content. During this time, the social aspect of TV was largely lost. The shared experience of TV was delivered by way of comments and asynchronously viewed content. Viewers could watch clips and share them with their friends or read comments left by other people, but real-time interaction was largely ignored. 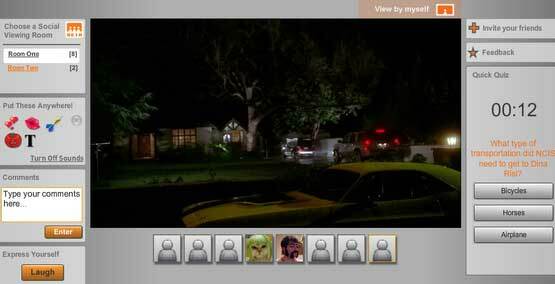 ClipSync is leading the re-emergence of TV as a social activity – the Social TV revolution. Viewers can create, share, comment and react to content in real time, only in a time and place of their choosing. Viewers now have control of their content and the benefit of social interaction. This phenomenon is connecting people, content and advertisers like never before, with ClipSync leading the revolution. The broadcasters themselves have obviously been making moves with various catch-up TV players embedded on the web. My presentation slides below have most of the UK, US and Australian ones included as examples. But not many have activated synchronous social widgets around the streams or more complex shared annotation, recommendations features. 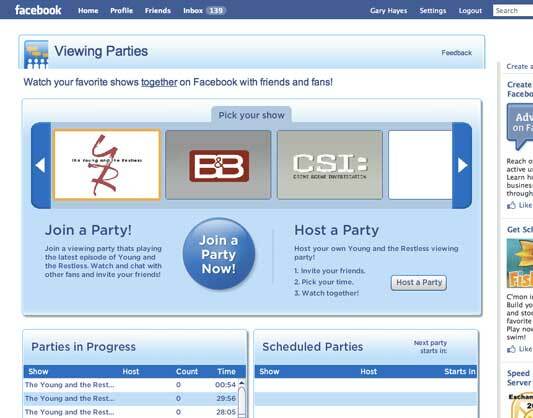 It wouldn’t be hard to implement of course but CBS have jumped the pack and introduced group viewing options with CBS Watch and Chat which is really Social catch up TV. 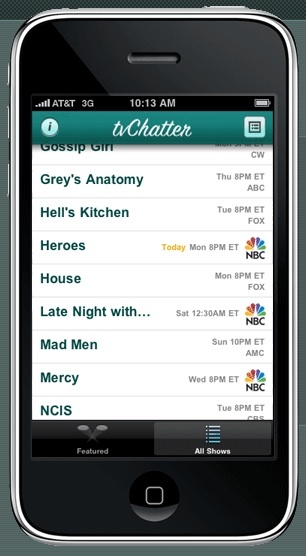 Watch episodes of your favorite shows while you chat and LOL with friends and fellow fans. Boo the latest villains on NCIS and CSI: NY at the same time, LOL in unison at the same crazy antics on How I Met Your Mother and Gary Unmarried and toss tomatoes at your least favorite Survivor. Hop right into one of the rooms below, invite your friends and start socializing! 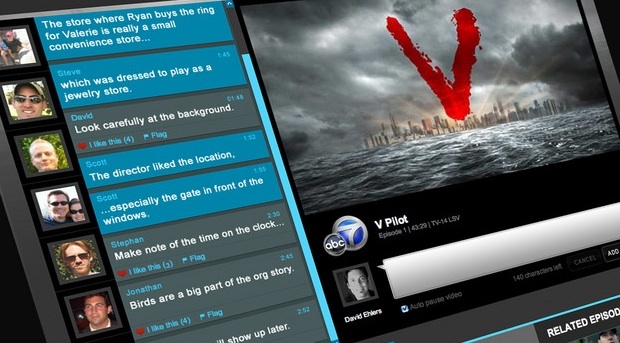 presents real time Twitter-fueled commentary about your favorite TV shows. Watch your show on your TV or PC, launch the tvChatter app on your device, choose the show from the social program guide, and watch the streaming commentary text. If you have a Twitter account, you can post your own comments, reply to others or filter on your followers for a more intimate conversation. TV.com is a rather traditional web based service, again linked with Facebook connect and where you can be a participant in producing the actual show guides, for friends and strangers. One of the more mature aspects of the service is the ‘social credits’ you get by contributing to the service – one of the true motivational elements of services like this. After you register, you will start getting points. Pretty much everything gives you points – even just visiting the site! – but the biggest totals come from adding episode summaries, writing reviews, posting to forums, blogging, filling out your profile and adding friends. As you get more and more points you will reach higher and higher levels. There are over 100 levels to reach, and the higher the level the more awesome bragging rights you have. Get enough points and you might even become the Editor of a show. As you go, you will also collect cool profile emblems that mark your contributions to the site and your participation in special events. This falls into one of many studies into this space and a white paper and associated technology thinking is available here. CollaboraTV is primarily a group watching system that allows individuals in the group to annotate, gesture and leave a trail of their ‘views’ for others to pick up later. This can really work (and it sounds awful in theory) if the person who left the trail is a trusted family or friend and you ‘really’ want to see what they thought at various points. Like other real time services too in CollaboraTV, the virtual audience appear as silhouettes in front of the screen, the back of the head brigade, simulating a movie theatre situation – again takes a bit of getting used to! AMUSE 2.0, the project on Interactive Mobile TV! I have put this slideshare show in a previous post but it is appropriate here to cover off any areas I may have missed above. This looks more at the key web, browser, based services which as is implied above, does it really matter now that the ‘live linear video’ element of TV is on any of the four screens (mobile, PC, lounge or shared outddoor / cinema)? The point is what applications sit around it to enable community and social activity. Thanks Paul – have joined. how do you think FreeMantle’s new sunquizlive.co.uk fits into all this? really, it is very interesting to see the trend moving towards watching tv shows online. I cant wait for virtual reality ! Incredibly awesome post, packed with good information. At a high level, one of the biggest things we’re seeing here is that people want to be socializing around TV programming, and they’ll go to great lengths to make it happen, even if it’s with ad hoc methods. So it’s great to see more formal solutions popping up to get out to the users. Great post from 2009 this is! What do you think about Connected TV? Or what Google has been doing? .-= Richard Kastelein´s last blog ..YouTube Aiming for the Big Screen in Your Living Rooms =-. Hledam investora a poradce pro vysilani. I’m all for giving the cable an satellite companies a little competition! I wonder if and when the monopolies of online TV will begin to surface? I think that the problem all of these sites will have is not the program but the pattern. People, on a global scale, are not accustomed to watching video at length on their computer. Once the TV gets more integrated, meaning that we see Internet content on our TV very clearly, these sites will all increase viewership drastically and the best will win out. Great post Gary! 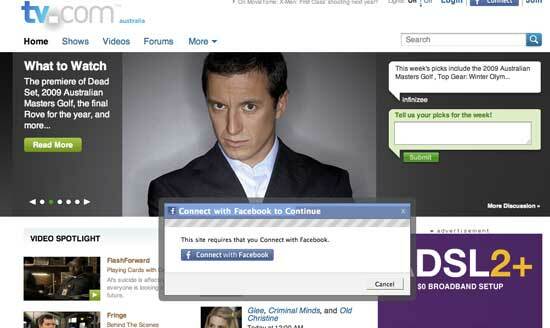 I hadn’t realized until reading this how much social media has been integrating into TV. iTweeVee just cracks me up. Thanks for sharing this. The largest tv network on the internet has been lunched. its the network that contains every part of internet activities. chatting, forum, blogs, watch full movies, download movies, watch trailers, episodes, alert birthday, news, adult toons and children cartoons, musicals, its a free sign up and you can upload your own video for your marketing or otherwise.